Leah Hogsten | The Salt Lake Tribune Debbie Matheson, left, talks with her docent choir member Lori Hayward. Two men and two women were chosen through a social media contest to sing with The Tabernacle Choir at Temple Square on Sunday, April 14, 2019. Leah Hogsten | The Salt Lake Tribune Seamstress Valorie Jensen, left, pins McKenna Reynolds' dress with shoulder pads as she and Debbie Matheson are fitted for their concert gowns. Two men and two women were chosen through a social media contest to sing with The Tabernacle Choir at Temple Square on Sunday, April 14, 2019. Leah Hogsten | The Salt Lake Tribune Seamstress Valorie Jensen, left, pins McKenna Reynolds' dress during a gown fitting. Two men and two women were chosen through a social media contest to sing with The Tabernacle Choir at Temple Square on Sunday, April 14, 2019. Leah Hogsten | The Salt Lake Tribune Debbie Matheson sees the concert gown she will wear Sunday when she sings with the Tabernacle Choir. Two men and two women were chosen through a social media contest to sing with The Tabernacle Choir at Temple Square on Sunday, April 14, 2019. Leah Hogsten | The Salt Lake Tribune Vance Everett, left, the Tabernacle Choir's wardrobe chairman, fits Daniel Wilson into the sport coat he will wear Sunday, when he sings with the Tabernacle Choir. Leah Hogsten | The Salt Lake Tribune Strands of necklaces hang in the women's choir dressing room April 12, 2019. Two men and two women were chosen through a social media contest to sing with The Tabernacle Choir at Temple Square on Sunday, April 14, 2019. 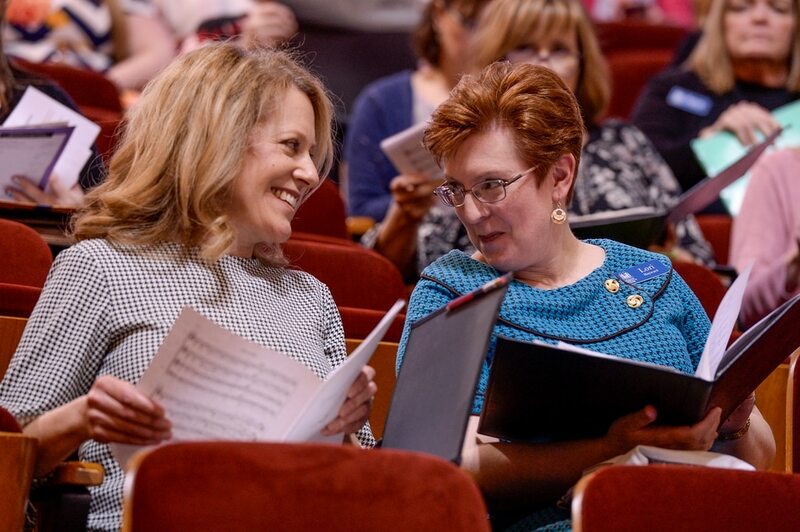 Leah Hogsten | The Salt Lake Tribune McKenna Reynolds, left, laughs with her choir mentor, Jill Furness, during a recent rehearsal. Two men and two women were chosen through a social media contest to sing with The Tabernacle Choir at Temple Square on Sunday, April 14, 2019. Leah Hogsten | The Salt Lake Tribune Debbie Matheson, in gray, warms her voice during rehearsal. Two men and two women were chosen through a social media contest to sing with The Tabernacle Choir at Temple Square on Sunday, April 14, 2019. Leah Hogsten | The Salt Lake Tribune Debbie Matheson, left, and McKenna Reynolds are welcomed into the women's choir dressing room prior to rehearsal. Two men and two women were chosen through a social media contest to sing with The Tabernacle Choir at Temple Square on Sunday, April 14, 2019. Leah Hogsten | The Salt Lake Tribune McKenna Reynolds is welcomed by Tabernacle Choir members prior to rehearsal April 12, 2019. Two men and two women were chosen through a social media contest to sing with The Tabernacle Choir at Temple Square on Sunday, April 14, 2019. Leah Hogsten | The Salt Lake Tribune Alaska resident, Matthew Breshears, meets his docent choir member David Stevenson prior to rehearsal. Four people were chosen through a social media contest to sing with The Tabernacle Choir at Temple Square on Sunday, April 14, 2019. Leah Hogsten | The Salt Lake Tribune Nicole Wilson marvels at the inside of the tabernacle while her husband Daniel Wilson awaits a seating assignment. Two men and two women were chosen through a social media contest to sing with The Tabernacle Choir at Temple Square on Sunday, April 14, 2019. Leah Hogsten | The Salt Lake Tribune Alaska resident, Matthew Breshears, warms his voice during rehearsal on April 12, 2019. Four people were chosen through a social media contest to sing with The Tabernacle Choir at Temple Square on Sunday, April 14, 2019. Leah Hogsten | The Salt Lake Tribune The Tabernacle Choir rehearses April 12, 2019. Among the singers are two men and two women, chosen through a social media contest, to sing on Sunday, April 14, 2019. Leah Hogsten | The Salt Lake Tribune The Tabernacle Choir rehearses on April 12, 2019. Among the singers are two men and two women who were chosen through a social media contest to sing on Sunday, April 14, 2019. Four people gambled — and won — Utah’s version of the lottery. Instead of pocketing millions, though, these winners — all members of The Church of Jesus Christ of Latter-day Saints — get a once-in-a-lifetime opportunity to sing with The Tabernacle Choir at Temple Square. “To have a chance to be in the choir is a dream,” said Daniel Wilson, a resident of Pima, Ariz. one of four people selected to perform with the choir on Sunday. Wilson, a father of six, has been listening to the choir — formerly known as the Mormon Tabernacle Choir — since he was 9. That’s when he would pull out cassette tapes and pop them into his father’s Walkman. 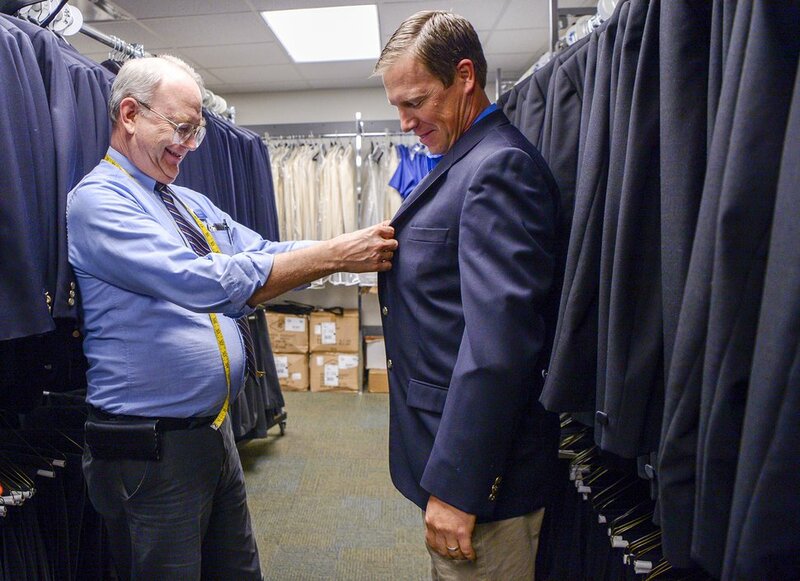 Leah Hogsten | The Salt Lake Tribune Vance Everett, left, the Tabernacle Choir's wardrobe chairman, fits Daniel Wilson into the sport coat he will wear Sunday, when he sings with the Tabernacle Choir. No musical experience was required to enter. Fans simply had to hit the “like” button on the choir’s Facebook or Instagram page, tag a friend and list three of their favorite tracks on the new CD, which held the top spot on Billboard’s Classical Traditional chart when it was released in March. Two men and two women were randomly selected from 6,243 entries, Barrick said. They will sing Sunday during the run-through of “Music and the Spoken Word,” which is held just prior to the actual broadcast at 9:30 a.m. While they won’t get to sing in the big show — the 30-minute program is broadcast worldwide — they will be recognized during the broadcast. Winners also took part in the choir’s weekly practice, getting their sheet music and their official wardrobe, including alterations for a perfect fit. They also were assigned a “buddy” from the 360-member choir who answered questions, showed newbies the ropes and helped them navigate the maze of rooms underneath the Tabernacle building where choir members dress and prepare for performances. 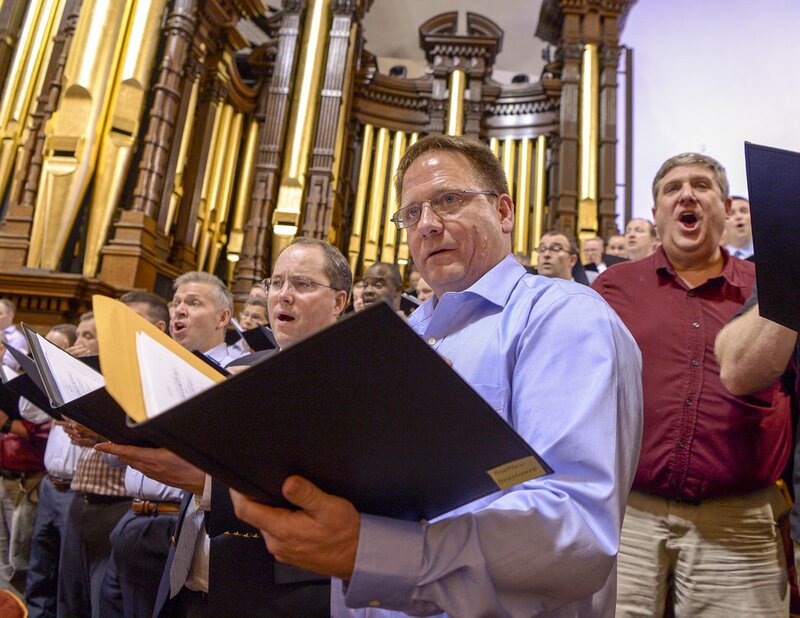 It’s just a taste of what it’s actually like to be part of the Tabernacle Choir — which requires a four-phase audition process that stretches over nine months and includes 16 weeks of training, Barrick said. Leah Hogsten | The Salt Lake Tribune Alaska resident, Matthew Breshears, warms his voice during rehearsal on April 12, 2019. Four people were chosen through a social media contest to sing with The Tabernacle Choir at Temple Square on Sunday, April 14, 2019. Contest winner Matt Breshears, a cabinetmaker, traveled the farthest. He flew with his wife from Palmer, Alaska — at his own expense — “just for the thrill” of singing with America’s choir. As an added bonus, he was able to visit two of his five daughters — one who lives in Eagle Mountain and another who attends Brigham Young University. While Breshears’ musical background is limited — “I sang ‘Johnny Appleseed’ in the second grade program" — he currently sings in his choir at his Latter-day Saint ward. Debbie Matheson and McKenna Reynolds live in Cedar Hills and North Salt Lake, respectively. And both are experienced singers. Before Thursday’s practice, all the winners were sent YouTube videos of the songs. Lori Hayward, an 8-year veteran of the Tabernacle Choir, said having guest singers — even if they are amateurs — brings energy to the whole group. “It recharges everyone,” she said. “When you are in the daily grind memorizing music and traveling, you sometimes forget how astounding it is to be in the choir. Seeing their joy, gets you excited all over again." 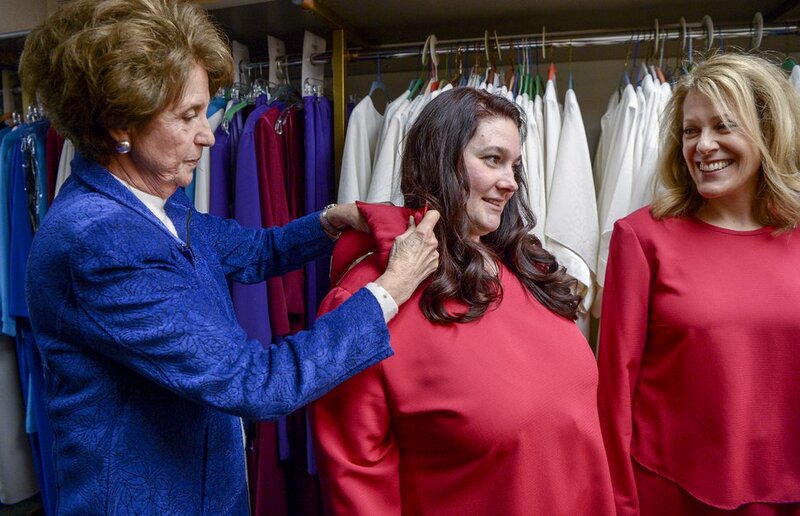 Leah Hogsten | The Salt Lake Tribune Seamstress Valorie Jensen, left, pins McKenna Reynolds' dress with shoulder pads as she and Debbie Matheson are fitted for their concert gowns. Two men and two women were chosen through a social media contest to sing with The Tabernacle Choir at Temple Square on Sunday, April 14, 2019.